Dr. Michael Berger said the new doctoral degree emphasizes teaching over business practices. Grand Canyon University now offers a doctoral degree to teach professors, teachers, nurses and business executives to better teach others. “The degree focuses on adults teaching adults,” said Dr. Michael Berger, dean of the College of Doctoral Studies. The new degree is a Doctor of Education in Teaching and Learning with an Emphasis in Adult Learning. For example, Berger said those with a master’s degree in business administration who want to teach can obtain a doctorate that emphasizes teaching over business practices. “Which can give the graduate both content knowledge and advanced knowledge of instruction,” Berger said. The degree joins GCU’s other Doctor of Education program in Organizational Leadership. “The new program is for those who want to stay in the classroom,” he explained. The Doctor of Education in Teaching and Learning degree is designed to give graduates the knowledge and skills necessary to work as advanced educators. Learners also will conduct original research with the goal of improving learning in schools, universities and the workplace. 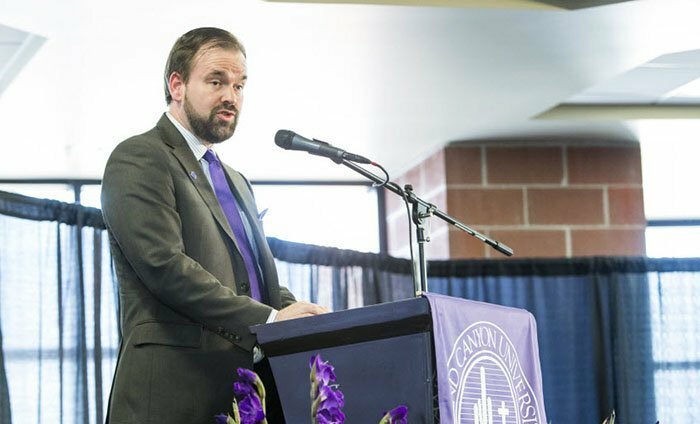 Like all programs at GCU, the new doctoral program weaves faith-based components into the curriculum to prepare learners to coach, mentor, and collaborate with others using their Christian beliefs. The Ed.D. program will examine theories behind educational practices and study practical foundations and educational theories. In addition, learners will study and conduct research into existing theories in adult learning and teaching.